This is the story of a remarkable elder who deeply affected those who knew him and what happened when his dream group decided to make a ceremony this Halloween to honor the anniversary of his passing. It’s a story about how ancestors and other elder beings participated in that ceremony. Our small community of eight dreamers has met on Friday evenings, almost weekly, for over twenty years, with only a small fluctuation in membership. About fifteen years ago we were joined by Dirk Spruyt, a retired doctor. I had met Dirk in the early days of the Center for Ecozoic Studies where we gathered to read and discuss implementing the work of “geologian” Thomas Berry. Sometimes we met with Thomas himself, as he lived about an hour away in Greensboro, North Carolina. Dirk, an avid environmentalist, was known for riding his bicycle all over town until well into his eighties while he faithfully kept his small decades-old car alive for occasional use. One evening Dirk, a widower, came to dream group and told us that at a Quaker conference on the environment he had met and hit it off with a woman, a divorcee, whom he was anxious for us to meet. Not long after that we attended the old fashioned Quaker Joining of these two lively eighty year olds at the Friends Meeting House in Chapel Hill. Their invitation explained that, “A Quaker Joining is an early Friends’ custom of committing to a relationship in a way that avoids participation in the social and economic discrimination associated with legal marriages.” They were in solidarity with the gay couples for whom marriage was not legal at that time. Perry was now a member of our dream group, too. 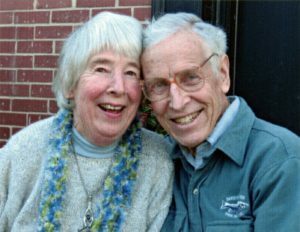 They were determined to live together in a local co-housing community called Arcadia. It took a couple of years for them to pull it off, but through some amazing synchronicities they were finally able to move into a small duplex with a large community garden right off their back deck. Dream group met at their home for another eight years or so when Dirk contracted Parkinson’s. His condition gradually worsened over the next couple of years. Finally Dirk and Perry began to gently share with us their exploration of the process of VSED (Voluntary Stopping Eating and Drinking) as the way Dirk wanted to handle his end of life. He decided that he would start this fast on November 1st. A few weeks before Halloween a young man who had found out about Dirk’s plan came to interview him and made a short film about him that was shown at the annual Death Faire in a nearby town. Another young man saw the film and wanted to come sing to Dirk. Friends were invited, a window was opened, a bird flew in, landed on a lamp shade, listened for awhile and flew back out. That’s just what tended to happen around Dirk. A friend who was helping them get their affairs in order discovered that they were not actually married and told them that Perry would need to have a marriage license in order to collect Dirk’s pension. On October 14th, the day before Dirk’s ninety-first birthday, she took them up to the courthouse at the county seat to get the Judge to marry them. At dream group that night Dirk and Perry, laughing giddily, told us this story: When they arrived at the courthouse they discovered that the Judge’s chambers were up on the second floor, so their friend went up and explained to the Judge that Dirk couldn’t get up the stone steps. The Judge said he’d come down and perform the marriage outside. Two men came down carrying four chairs and arranged them on the sidewalk. The Judge said that their friend could be one witness, but they would need two. So she went across the street to the local food co-op and recruited a young man with strawberry blond hair that stood straight up from his head about five inches high. When the Judge was about to begin, Dirk said, “We need some music!” By then a small crowd of passer-bys had gathered to watch the proceedings. One of them pulled out his smart-phone, found a song, Earth, Wind, and Fire, and stood there for the whole ceremony holding his phone out so everyone could hear.Then the Judge told these ninety-somethings they could kiss! On October 30th our dream group attended a large party at the Friends Meeting House to say goodby to Dirk. We all thought we were at this gathering to honor Dirk, but he had something else in mind. He told us that when he died he wanted to be a bridge between us in the living world and those on the other side. He asked us to go around the room and tell what we wanted him to take with him to form that bridge. Person after person kept offering up how much Dirk meant to them, giving examples, some elevating and others very funny, of how he had affected their lives. Repeatedly Dirk would stop us and try to re-explain that this was not about him, that he wanted us to tell him what we loved about this world so he could take it with him to the other world. Normally humorous, Dirk was quite serious about this. People had a hard time understanding, but gradually, from one corner of the room, then another, voices tentatively began to describe, “Rainbows ”. . . “Butterflies”. . . as we caught his meaning. And, he said, he might also be able to bring something back to us. I asked him to take our love to the deep time ancestors and bring back their wisdom to us in these dire times. He said, “I’ll take that very seriously!” Always a man of determined ideas and principles, he patiently led us through this process, even though it seemed to be rather painful to those who avidly wanted to focus on honoring him, as this would be the last time many of them would see him. Dirk was surrounded by friends and family until he died sixteen days later. He was a man who had such strong convictions and sense of responsibility that he took responsibility for this own good death and also prepared us for our loss. For example, when discussing a dream, he suggested we remember to ask, “Now, what would Dirk say?” And listen for an answer. This year Perry expressed the need for some nurturing during this, the second anniversary of Dirk’s passing. Because Halloween, or All Hallow’s Eve (Irish Samhain), is the liminal, in-between time when the veil is especially thin and the spirits are especially close by, we realized it would indeed be an auspicious time to honor him. Dream group happened to be meeting on All Soul’s Day, November 2nd, which is traditionally the time to commemorate souls who have passed. We decided to make a small ceremony to remember Dirk and to renew our bond with him. Since Samhain originated in Ireland, I brought a candle that was lit from the perpetual flame at Brigid’s center in Kildare and drummed for some minutes, as Dirk often did for us, to hold a silence. Then we each lit a tea light from the hallowed candle to take home and light each evening as a vigil to remember Dirk during the two weeks that he fasted. We hoped to invite communication from him and perhaps even induce a group-level dream. We planned to follow this with a potluck dinner and a larger ceremony on the 16th to honor his passing. Knowing how much I love creating rituals, I was appointed to be the ceremonialist. So, I began to wonder how we might celebrate Dirk. Meanwhile, interested in learning more about the various American Indian tribes who lived in our area of Piedmont North Carolina (some of whom survived the destruction and continue to live here), my husband and I went with our hiking group on a field trip to Town Creek Indian Mound. We saw these extinct Pee Dee people’s burial mounds and learned about their burial rituals. We saw where in the communal structure at the top of the temple mound they kept a Sacred Fire perpetually burning on logs laid in the four directions. 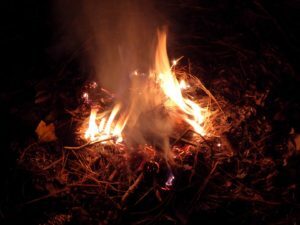 As part of their yearly harvest and renewal ceremony, the people took embers from this Sacred Fire back home with them to light their own hearth fires. This strengthened their community and sense of connection with each other. Beside the plaza ground we saw how full the rushing Little River was, there at the confluence with Town Creek, almost covering the remains of their rock fish weir. 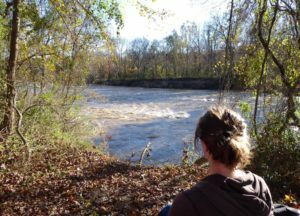 Synchronistically, a few days later, we went with another group for a walk along the Haw River. We met at the nearby town of Saxapahaw, where we learned that the Woodland Culture Sissipahaw peoples had had a large village. They were wiped out by the 1740’s. Other than artifacts in a small museum, all that remains is their old rock fish weir. It, too, was almost completely inundated by the very wide and fast Haw River. Clumps of leaves up in the trees showed how high the river had gotten during the flooding by the recent hurricanes Florence and Michael and subsequent rains. The levee was impressively high, the newly deposited layers of sandy soil partially covering the frost asters and other shrubs along the bank. I still had no idea what I would offer for the ceremony. But a few days before we gathered I, for no apparent reason, had an impulse to open up a book called Earth Prayers. It had been sitting on my desk unopened for the six months or more since I had put it there thinking I might read something from it every day. I opened right to the Invocations and Benedictions section and to a prayer-poem that I knew instantly would form the core of the ceremony for Dirk’s passing. We would animate the words of the poem with ritual actions. (Perhaps this idea arose because Perry often encourages us to enact our dreams, bringing them to life through Dream Theatre or dialogue between dream characters.) I knew that love for Dirk and my dream group community would draw out creative energy for the rest of the ceremony. Once the loving impulse to do a ceremony gets activated, the intuitions and synchronicities start happening. There is a feeling of being connected to something larger (Spirit, the Spirit World, Self as aspect of Spirit) that starts participating. On the eve of the ceremony I removed the candle I had been burning for Dirk from my ancestor altar where he had been forming a tangible bridge to my German grandmothers, healers all. I placed the lit candle on top of the book that held the poem that I would read, and I invoked some spirit-help to come during the night. In the morning I caught the tail end of this dream: I’m walking with a small group of people along either two different rivers or one river in two different locations. In one area, the shrubs on the levee are green. In the other area they are maroon. I say to a man who is leading us, “I don’t understand. Leaves are usually redder in the shade and greener in the light, but here it’s the opposite.” Then, I am explaining to my daughter how the river made the levee by depositing the rich, sandy soil, and she is considering starting an eco-tourism company to show people this. As I’m half-waking from the dream I notice a felt-sense of connection between the dream and last night’s honoring of Dirk and my German grandmothers at my altar. Something about the river of generations depositing nourishment for the ensuing generations, as Dirk tried to do for us. In the dream there is a mystery, things are not as they seem; there’s a reversal of what we usually think of as what happens in the light and what happens in darkness. The dream left me feeling both nourished and part of a flow of nourishers. I felt a vast sense of spaciousness. From this spaciousness the idea arose to hold a period of silence after the ceremony in which the group members could share from the heart, Quaker-style, anything that came to us in the last two weeks of candle-vigil, or during the ceremony itself, or memories of Dirk that arose. I titled this dream the River of Life to honor the last dream Dirk told us. It was the sixth day of Dirk’s fast. We had called Perry to see if they wanted us to come over for dream group. Dirk had yelled out an enthusiastic, “Yes!” He seemed joyful and mischievous as he told a dream in which he had invented a friendly competition to see who, he or a co-worker, could transport people’s boxes of papers up to an upper floor faster. He said that it was a fun game to liven up a dull job. “Perhaps you are carrying these boxes up for us,” someone said. “Like a bridge,” someone added, “like a ritual.” Dirk said, “To bridge between everything and the particular is the basic ritual. Everything else is an elaboration of that.” “I would like you to make a ritual to contact me,” he concluded. Preparing our circle: We purified ourselves, enlivened the energy in the room, and joined our hearts together by making music. With small percussion instruments, rattles, shakers, and chimes, we closed our eyes and began pretending we were night critters gathering around a clearing in the forest, listening to each others’ sounds and responding, thus creating a little night music, adding our voices to the quiet of the night, hoping to attract curious helping spirits to the strange noises. After a while we began quietly singing, Listen, listen, listen to my heart’s song. Listen, listen, listen to my heart’s song. I will never forget you, I will never forsake you. I will never forget you I will never forsake you. Over and over we sang this as a never-ending round that drifted into the night. The invocation: We invited our teachers in the dream world, our loving grandmothers and grandfathers who have gone before us, and the Spirit of Creativity, the Spirit of Imagination, that guides our dream circle to be with us. The intention: We acknowledged our desire to come together to remember Dirk, a man of strong convictions who nurtured his community and this land; to continue to connect with him as he bridges between us and the spirit world; to strengthen our community as we honor our elder in life who in death continues to join us; and to grieve him well, as we would each hope to be grieved, so that our souls may continue to evolve in the spirit world, so that we may continue to nourish the lives of our community and our descendants. Reading it again line by line, we enacted the poem, passing a cloth-lined basket into which we contributed our sensual offerings. Beautiful designs were created as each person silently added ingredients to animate the line of the poem. The designs kept changing as each new poetic line of items was layered. A symbolic progression emerged as botanicals were added to the basket, from fresh flowers, flower essences and violet leaves to native dried grasses, to winter-evergreen mosses, to bare soil with dry fallen leaves of maple and oak. When a line that we added to the poem was read, Make a mark for me, we each wrote or drew something for Dirk and tucked these little paper epitaphs into the soil. We stood a bare birch-branch “tree” up in the soil to witness our love-creation and to help our love climb up to Dirk. We wrapped all of this into a bundle and tied it with yarn, to be burned to send these blessings up to Dirk on the smoke. When the offering-bundle was completed, each person again lit their candle from Brigid’s flame, and we sat in the light-filled darkness and waited to speak from our hearts any thoughts or feelings that arose from the weeks of vigil or during the ceremony or from memories of Dirk. The next night we burned the bundle outside in the fire pit, hoping Dirk was enjoying laughing at our efforts to get the wet wood and the damp bundle to burn. Well, there was plenty of smoke to carry all those blessings on the air up to Dirk! As I reflect on this sequence of events it all begins to seem like a Big Dream woven from threads connecting rivers and ancestors, fire and light, dreams and dreamers, ancient ritual and modern ceremony in a vast web of time and space. Perhaps the rivers and the ancestors all joined in the creation of this ceremony to honor our beloved elder! All of us participated. Where do you draw the line of participants – at just us humans? At the ancestors of this place and the rivers where we live? At the elements of earth, air, fire, and water? All of us participate when we make ceremony. When the things of this world are felt to be alive and communicating with us there can be a sense of mutual participation, us with them, them with us. What a precious awareness! Perry told us she read that ceremony helps us remember to remember. What if we remembered to be aware that this interweaving is actually happening all the time? The threads are just more vividly colored at special moments in the cycle of living and dying. How are these happenings different from the synchronicities that we dreamers know signify the presence of Spirit, or the presence of Self as an aspect of Spirit? They’re different because the weaving moves from Great Spirit to the very specific spirits of the rivers and from there to the rivers themselves as animate beings. In other words it’s a web that is both very big and very intimate, that bridges between the everything and the particular, as Dirk put it. 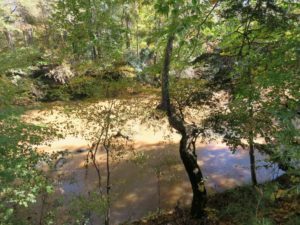 There is a sense of relationship to the animate Haw River, to the living Little River, to the Pee Dee and Sissipahaw ancestors of place, to all these beings as persons who care about the land and who care about humans, like Dirk, who love the land. I glimpse a genealogy of generosity in which our local rivers, our native grasses, mosses and oak trees are elder beings of the land, and we are one more generation in the ongoing generativity of people plus rivers plus flowers plus . . . plus everything with which we share Life. The fewer wild beings there are living around us, as their habitats are destroyed for development, the less these possible love-engendered interactions become possible. We need healthy rivers with which to have nourishing dreams. We can cultivate an ongoing intimacy with a particular plant (see Hazelnut Wisdom) or with a particular animal or rock and also be open to the possibility of other beings of the land showing up and participating in our honoring, blessing and healing rituals. What if the indigenous elders are right who are telling us westerners to wake up and realize that we all can, must become indigenous to the land where we live? What if these places where we live want to communicate with us? What if we make a ceremony to honor an elder, and the other elders want to join in? Then we should thank them. Violet leaves, thank you for holding space on this wet ground, for feeding the caterpillars of the fritillary butterflies and, in turn, our birds, and for coming to participate in our ceremony. Little bluestem grass, thank you for bringing your beauty to us, for providing places for small critters to shelter and seeds for them to eat. Thank you mosses for clothing the bare earth, for being so beautiful while doing so, and for making such a lovely lining for our offering bundle. Thank you rivers for refreshing the lives of plants, animals and humans and for reminding us in our dreamings of the continuous flow of life. Thank you, sacred fire, for connecting us when we share your holy flame. Thank you ancestors of place and of blood who preceded us in honoring this beloved land. When I finished writing this story I called Perry to check on a few of the details. I was surprised when she added this memory: “A few days into his fast Dirk told me he had a vision. He was lying in bed looking up at the ceiling and the ceiling fan when they disappeared and there above him was the night sky. After that,” she said, “he stopped talking about becoming part of the earth. From then on he talked about ‘crossing the river’.” So that’s why those rivers kept appearing in the outer world of nature and the inner world of dream, seeming to want to participate in honoring him! May we all become bridges across the River of Life for our loved ones. And may our sense of community expand to include all the beings, the native plants, animals, rivers and ancestors of the sacred Place that we call home. A beautiful accounting, and makes me feel a bit like I was there. Barb, I hope you will be back here someday so we can do ceremony together! Thanks so much Betty Lou. Such a beautiful story about a beautiful man and his lovely community. Helped me remember and say goodbye to Dirk. I remember the Quaker joining ceremony. Love to you all and to Perry if you’re following this strand. Irene, dear dreamer, you were such an integral part of this dream community, and your spirit stays with us, too. I hope we will find a way to dream together again. Your beautiful flowing words awaken wonder, Betty Lou. I think Dirk was with us, vividly, that night, and that our ceremony strengthened his capacity as a bridge. Thank you for paying patient attention to the natural and the human world, and how we are intertwined, and for sharing with us the fruits of your loving attention. Jean, thank you for your support of our intimate community in so many ways. I look forward to co-creating more dream-ceremony with you so that our dreams may be bridges connecting us with the natural world and with the spirit world. May wonder be the medium of our intertwining. I so enjoy reading your stories! Thanks for including us in your beautiful world! Oh yes, Jude, this gorgeous world is constantly telling us beautiful stories! Betty Lou, this story is so beautiful. Thank you so much for sharing it. It really resonated with me. Mary, thanks for your kind words. Sometime I’d love to hear what in your life resonates with these words, so I can come to know you better. What a wonderful ceremony (and story about dear Dirk)…I love that the “participants” included ancestors as well as the elements in honoring Dirk. Yes, Jill, it truly seems like every level of being was eager to join in celebrating Dirk. May our dreams and stories remind us how we are all interwoven in the fabric of life right here, right now. Thank you, Betty Lou. I enjoyed reading the rest of the story and your wise observations. Thanks, Karen. May we listen well to the rich stories your dreams are telling! I never met Dirk, but I feel I encountered his beautiful soul through your beautiful story, the ceremony, and your remembrances. It is a gift to get to know a place or a person with particularity, and with heart, and more special when the two come together. Yes, Barb, you really understand that it’s about communities loving particular people and the particular beings of the place in which we dwell, all woven together in community. Dirk did the weaving. Thanks very much for your response, for the quote, and for bringing the important word ‘particular’ deeper into the conversation. I loved reading the vivid and rich descriptions of both the relationships and the surrounding images of Nature. Lovely ritual. Sharon, I have a feeling that the relationship of people with the spirit-filled nature that surrounds us is happening richly all the time. Encounters with Life and Death are what helps make them more vivid, therefore more detectable. I think that our ancestors used to keep this ongoing relationship present in awareness through ritual and ceremony. You have done a masterful piece weaving your experiences, your thoughts, your loves, and your friendships with beings of all persuasions. I love the idea of how many beings are participants in the weaving of a moment, and a ceremony is kind of like a consious moment amplified by intent, by awareness, by love, by community. The very act of writing such a piece is a ritual in itself, as it weaves the experiences, the moment of writing, and the moment of reading together in love and sacredness. “Something about the river of generations depositing nourishment for the ensuing generations, as Dirk tried to do for us. In the dream there is a mystery…” And as you lovingly pull the strands of awareness and weave them into words, you are both part of the mystery and passing on the mystery. Thank you, Mystery Weaver! Laurie, thank you for being in dialogue with me about the mystery. You are adding to the many threads of awareness. When you point out that the beings who who are “participants in the weaving of a moment” are many, I get a sense of the vastness all over again. Yes, thank you, a ceremony is a conscious moment of amplified awareness of what is going on, largely unnoticed, all the time. And, yes, writing a story about it is a kind of ritual which further amplifies the shared experience. Your ritual of reading broadens the circle of participants in the mystery of our interwovenness! Thank you for following dreams and intuition. It inspires me to do so myself. Hi Joanne, thanks for reading! 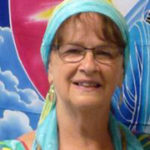 I’m sure that your dreams and intuitions will richly enhance your wonderful work as a healer. I enjoyed reading the story of Dirk and Perry’s “official” marriage by the judge. I am glad to know so many of the details about the history of dream group and Dirk and Perry. Thanks for writing this all down – the ceremony and the rich background. Thanks, Ann, for reading the details of the backstory of Dirk’s passing and his subsequent appearances to us in our dreams that never even made it into the story! Yes, I’m grateful for such shared warmth and richness. Thank you for sharing the intimacies of Life on both sides. Your writing shares the mysteries of our universe’s Oneness and far beyond. As I read and walked with Dirk, you, our ancestors and Spirit I celebrated the glorious awareness and love that abounds within each being. Aho! Suz, you who have experienced the mysteries of the Other Side as well, and know the Oneness of Spirit, thank you for reading and responding from your heart so deeply.